COLORADO SPRINGS, Colo., Dec. 28, 2016 /PRNewswire-USNewswire/ -- During a recent Wounded Warrior Project® (WWP) outreach event, injured veterans and their families added a personal touch to their holiday decorations by designing cards and ornaments. 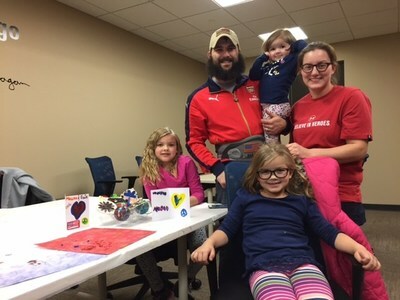 The kid-friendly event was an opportunity for military families to connect with fellow warriors in their community. Army veteran Christopher Gorman saw the gathering as a chance to bring his wife and kids to a festive event and spend time with other service members. "I appreciate any opportunity for my family to connect with others during the holiday season," he said. "Even something as simple as making an ornament can have a positive emotional impact." "This event provided my family some quality time together," said Air Force veteran Kristopher Bailey. "From the ornament-making to the holiday cards, we were able to bond and have a great night." Gatherings like this support the long-term recovery needs of warriors by reintroducing them to the unique bonds experienced during military service. Providing opportunities for connection – in settings that accommodate physical injuries and social anxieties – limits the potential for isolation and creates a support structure during the healing process. "You cannot get better – physically or mentally – if you don't get out there and participate," Christopher said. "Staying holed up and alone is not the way to go about it. It may take some determination, but getting warriors together to address concerns and express emotions is key to successful healing. Without Wounded Warrior Project, I would have ended up on a significantly different path." Kristopher agreed that becoming part of WWP has helped him greatly as he has struggled with isolation and combat stress. "Being a part of the Wounded Warrior Project family means the world to me," he said. "Before joining, I felt lost and helpless because I thought no one understood what I was going through. It is a family I have grown to love, and it has been a blessing to have others to talk to. Now I have the knowledge to help others as well as myself, and that feels amazing." Kristopher's experience shows how WWP empowers wounded warriors to mentor other veterans and embody the WWP logo of one warrior carrying another off the battlefield. WWP staff members interacted with warriors and families throughout the program event, advising them of additional services and resources to assist in their recovery processes. WWP programs assist injured veterans with mental health, physical health and wellness, career and benefits counseling, and connecting with other warriors and their communities. Through the generosity of donors, these programs are available to injured veterans, their families, and caregivers at no cost to them.